I love a good grammar dilemma! Yesterday, I wrote about my efforts to improve my hand lettering. I posted the following photo of my ongoing attempts and wrote that I had taken a quick break to practice, practice, practice my lettering. Now here's the dilemma: The lovely Margot/NZ left a very kind comment about the use of the words practice and practise. Practice is the noun and practise is the verb. Which I totally agree with . . . except I think it depends on where you live. When I was a kid, I was taught exactly the same rule that Margot/NZ described. I grew up in Southern Ontario, Canada, where I still live. I've noticed in recent years, however, that the s just isn't used around these parts anymore. Which is why I went with practice instead of practise in my post. Also, I understand that in the U.S., practice serves as both the noun and the verb. After a bit of brief research, however, I've discovered (thanks to Margot!) that the distinction is alive and well and in regular use outside North America. So, I was going to rewrite my page for Margot as practise, practise, practise. Except that now I'm confused about whether that would be the correct course of action. I get that I should have written: I took a quick break to practise, practise, practise my lettering (the verb), BUT on my page, I think it should still be practice, practice, practice (the noun). Right? I think? Ack, I'm not sure. For example, the phrase practice makes perfect is totally clear. In that context, practice is the noun. But I only wrote the word practice three times, so it's not as clear. Was I referring to the noun practice or the verb practise? Help me out! Which is it? If it should have been practise, I am totally going to rewrite that page! P.S. Thank you so much for all of the comments on my last two posts. I have stopped by and replied to each of them! Thanks, Roxann! I love these discussions like these! I think if you're going to use it for anything else than personal use, I would make both available. We are very sensitive to the issues that surround the "s" vs the "z" and the color vs the colour .... having lived where we have. Then add into it that many also add an "s" to the end of Math ..
Our poor kids are so confused! How fascinating that the distinction between noun and verb has almost disappeared in North America! And thanks for the nice reply to my comment and this follow-up post (and for not thinking of me as a grammar nazi, too!). If you are honing your handwriting skills (note the avoidance of any variation of the dreaded practi(SC)e word!) repeating any word furthers your quest. How it's spelled (spelt? - is that another dilemma?) doesn't really matter. However I recall one of my friends lost crucial marks in an art evaluation because her delightfully flower-embellished word was spelled "feminene" instead of "feminine", so perhaps the real lesson is that context is everything! Margot! I've totally been avoiding practice/practise, too, now. I'll have to go back at some point because there is a lot of practising/practicing happening over here. You're absolutely right - context is everything. Thanks so much for prompting a really fun discussion! I think that the usage depends upon the meaning of the writer which is subjective. 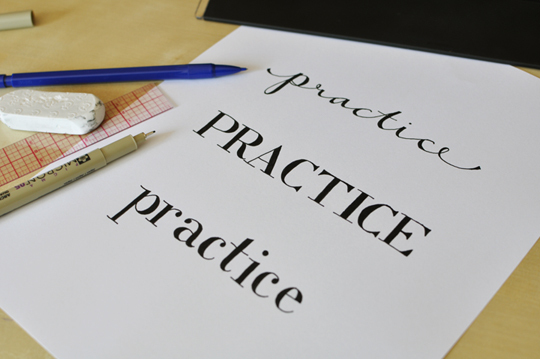 If you write "Practice, Practice, Practice" it could be read as a noun in that the writing itself is the product of the action. It all depends on how you think about it. I would suggest that since you cater to both American English and (for lack of a better term) Queen's English speakers, it could be the version with the c since it would be correct (depending on how you interpret it) for either population. However, it is your work so you do whichever speaks to you! Hi Lauren! I think that's exactly what I'll end up doing - using the c. Thanks so much for stopping by with your thoughts. I loved this discussion! I am a little late to the party. None the less, I love a good discussion on words. I just stumbled over that post and I have no idea which word is the right one (as I'm no English native speaker). But: if you write the word with an "s" you can practise/practice the writing of another letter, not that bad, hum?